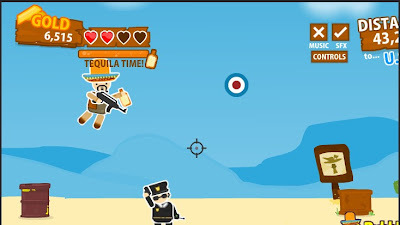 Over The Border is another addicting physics based launch game from bubblebox. The game sets in the Mexican and American border which Bandito must cross. Launching the dummy and making it bounce for as long as possible is cool but what's cooler is the shooting action while bouncing and using tequila time to slow down time. You can also earn cash and use it to make upgrades to your weapons, weights and armor that will improve your efficiency thus getting you closer to crossing over the border. Tip: upgrade first the weight to cover more distance that will make you earn gold faster. Meanwhile, here is short video of Over The Border walkthrough to learn something from.